Even if you are not in charge of anyone, you can show leadership NOW. Learn how all employees can show leadership. All you need is something new and worthwhile to say along with the courage to promote it. Click on the book to buy from Amazon. Leaders challenge the status quo and promote new directions. They DO NOT manage people OR get things done. Managers get things done through people by being inspiring, supportive and facilitative. They are more like sports coaches than cold overseers and controllers. Leadership is an occasional act, a free-floating guerrilla activity, not a role or position. Technical staff with no charisma can show leadership by challenging the status quo aggressively, with quiet conviction or hard facts. Emotional intelligence and interpersonal skills are nice add-ons but not an essential part of what leadership means. Leadership must = promoting new directions. Otherwise how can we explain leadership that is shown upward or from the side-lines? When you promote new products to your bosses, they don't report to you, even informally or temporarily. Martin Luther King showed leadership from the sidelines or bottom-up to the U.S, government when he campaigned against segregation on buses. He did not manage those in charge of implementing his vision. Hence leadership has nothing to do with managing a team - this is a radical claim! Leadership is based on the courage of your convictions and youthful rebelliousness, not a learned skill set. Only influencing skills can be developed, not the drive to lead. Many who claim that all employees can show leadership offer a concept of leadership that is totally confused with management. I show how to separate the two once and for all. Leadership sells the tickets for the journey, Management drives the bus to the destination. Occasional injections of leadership may be necessary enroute if passengers on the bus start to question the wisdom of the destination. Management and leadership should be defined functionally - leaders promote new directions, managers execute them. This is different from John Kotter's functional definitions because he claims that leaders also need to be inspiring while managers don't. Today, it should be obvious that leaders can move people with factual arguments stated in a quiet, logical manner. Some are inspiring, some aren't. Some followers find hard facts more convincing than a cheer leader's emotional appeals. All definitions of leadership based on any particular influencing style will always have exceptions. Hence, we need to separate our definition of leadership from references to influencing style. In addition, managers need to be seen as empowering, facilitative and as good coaches, not narrowly as controllers. In short, leaders and managers can use different styles to move people as required by the situation. The function of management needs to be retrieved from the trash where it was consigned in the late 70's and 80's when there was a hue and cry to replace managers with leaders. This call is directly counter to the conventional wisdom as published in the Harvard Business Review's collection of articles on leadership which still includes the views of John Kotter and Abraham Zaleznik which were written in the late 70's, early 80's. Zaleznik portrays management as an obsolete, controlling function, a view that needs to be seen as itself outdated and obsolete. All employees are better engaged when they discover how to show leadership NOW, without having to wait to be promoted to a ''team leader'' role. Executives gain focus when they get clear what management and leadership really mean. Innovation and continuous improvement are stimulated as all employees take more ownership for showing leadership rather than depending on those in charge. Makes sense of how leadership can come from outside the organization as well as bottom-up. Think of Apple leading Microsoft or Martin Luther King showing leadership to the US government when demonstrating against segregation on buses influenced the Supreme Court to rule it unconstitutional. Think of leadership in a golf tournament. The point here is that leadership shows the way by example or explicit promotion of a new direction. If we focus only on what it means to be in charge of a group we get a very distorted picture of what leadership means. Makes sense of how you can show leadership to your boss even if you have nothing to do with implementing your proposal. If you convince your boss to change direction, you have shown leadership even though you may not manage the team that implements your proposal. So, how can we define leadership so that it entails being in charge of a team? Burn! straightens out the mess that leadership theory has become. This book has the potential to revolutionize how we think about leadership. 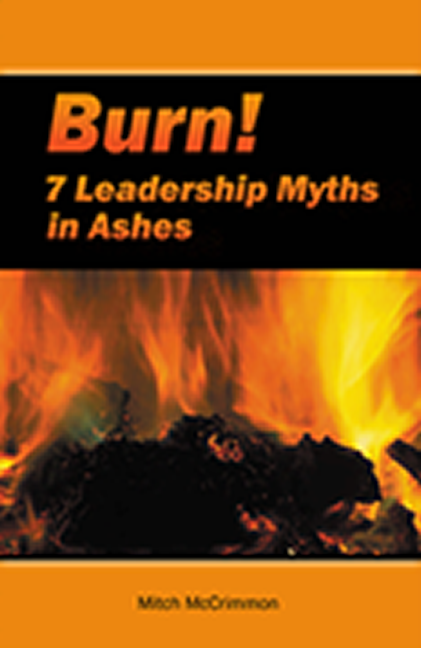 To show real leadership in your organization, buy Burn! Start promoting innovative ideas about the meaning of leadership to transform your organization's competitive advantage.